One of the most exotically beautiful buildings in the British Isles, the Royal Pavilion is the magnificent former seaside residence of King George IV. Its fantastic domes and spires make it an easily recognizable icon, to both residents and visitors to Brighton & Hove alike. The story of the Royal Pavilion includes parties, hospitals and flower shows, contains influences from China, India and France, and includes characters as diverse as fishermen, monarchs and soldiers. As a unique palace, with a fascinating history and breathtaking decorations to discover, the Royal Pavilion has also played a key role in the development of Brighton and its international reputation for over 200 years. So how did a poor fishing town become the most fashionable coastal resort in Britain? 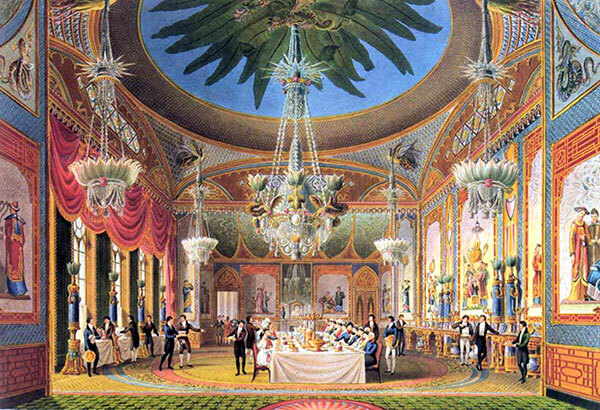 What was the vision behind the design of the Royal Pavilion? And how does the Royal Pavilion continue to influence the character of Brighton & Hove to this day? The Banqueting Room acquatint by John Nash. Here the King entertained foreign royalty, his ministers, his friends and family. In the Domesday survey of 1086 Bristemestune (Brighton) was valued at £12 and was charged a tax of 4,000 herring, a figure that testifies to its status as a small fishing town. The medieval town was contained within East Street, West Street, and North Street. St Nicholas Church at the top of Church Street served as both a place of worship, St Nicholas being the patron saint of fishermen, and as a beacon to guide fishing boats back to shore. In June 1514 Brighthelmstone (another name for Brighton) was burnt to the ground by French raiders during a war between England and France. Only part of St Nicholas Church and the medieval street pattern of what is now the Lanes survived the attack. During the reign of Queen Elizabeth 1 (1558-1603) Brighton had amassed a large fishing fleet and by 1660 was the second largest town in Sussex. Brighton fishermen used 'Hogboats', which suited fishing conditions at Brighton. They had a very wide beam making them stable in rough seas and were easily hauled onto the shingle beaches. Some were even cut in half and used as homes on the beach by the poorest fishermen. By the mid 1700s, Brighton had sunk into decline. Between 1665 and 1705 a series of great storms led to severe coastal erosion, which destroyed large areas of the seafront. The livelihood of the town was threatened as it became increasingly difficult to set sail and bring fish ashore. By 1740, Brighton’s population amounted to no more than 1,000 people. Brighton’s transformation from a struggling fishing town to a fashionable seaside resort began in 1750 with the publication of a book by Dr Richard Russell of Lewes entitled ‘Dissertation in the Use of Seawater in the Diseases of the Glands’. Dr Russell specialized in treating ailments such as gout but also recognized the benefits of physical exercise for people leading sedentary lives. He believed in the therapeutic value of the iodine in sea water and the medicines he gave his patients to drink included ingredients such as woodlice, cuttlefish bones, crabs’ eyes, bicarbonate of soda, milk and sea water. Dr Russell’s reputation, combined with Brighton’s proximity to London (it only took three to five hours to travel from London to Brighton) gave the town an advantage over other seaside resorts and ensured its success as a fashionable seaside resort for high society. The impact of Dr Russell’s endorsement of Brighton was immediate. Unemployed fishing families were quick to take advantage of opportunities to provide a range of services to wealthy visitors. Lodging houses sprang up around the town to accommodate Dr Russell’s patients, and an evolving building industry met the demand for lodging houses for the town’s new holiday-makers. But perhaps most famously, many fishermen and women found new employment as dippers and bathers. Dr Russell’s sea cure advocated the total submersion of the patient in the sea. Access to the sea was provided by bathing machines, small boxes on wheels in which the patients were seated while bathing attendants transported them from the beach to the water. Dippers (for women) and bathers (for men) were employed to make sure the patient’s head was dipped into the water. The most famous bather in Brighton was Smoaker Miles, who later taught the Prince of Wales to swim in the sea. Martha Gunn was Brighton’s most famous dipper. She lived in a house in East Street, and is buried in St Nicholas churchyard. Dipping took place all year round since cold water was considered to be good for the health. However indoor baths also developed from 1769 for those who were not brave enough to go in the sea all year round. 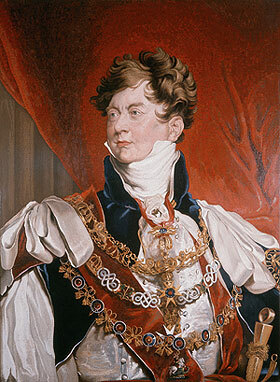 George IV first visited the town shortly after coming of age in 1783, when he was still the Prince of Wales. He stayed with his uncle, the Duke of Cumberland, at Grove House on the Steine. He was prompted to visit on the advice of his physicians who thought that the sea water might ease the swellings of the glands in his neck. However another and perhaps stronger appeal was the desire to escape the constraints of the stifling court of his father. The attractions of Brighton were not purely medicinal, for the Prince also enjoyed the lively company of the circle of the Duke of Cumberland, the theatre, gambling and the races. Throughout George’s lifetime, the town of Brighton provided an escapist playground where he could indulge all his passions: dining, music, gambling and women. Brighton’s distance from the Royal Court in London meant that the town also provided a discreet location for the Prince to enjoy liaisons with his long-time companion Maria Fitzherbert. The Prince had secretly married Maria in 1785, but the marriage was declared illegal because descendents of George III were not allowed to marry without permission from the monarch. The Prince eventually agreed to take a more appropriate wife and in 1795 he married his cousin Princess Caroline of Brunswick. Despite the birth of their daughter Charlotte in 1796, it was a loveless marriage. The Prince had many mistresses throughout his life, the most enduring of which was Maria Fitzherbert, for whom he built Steine House (now the YMCA), which was conveniently near the Prince’s residence. After the Prince’s first visit to Brighton, George rented a ‘superior farmhouse’ on the Steine, from local landowner Thomas Kemp. In 1787 the Prince asked architect Henry Holland to transform the farmhouse. The resulting small neo-classical structure with a central domed rotunda and glazed tile exterior was known as the Marine Pavilion. Although not as audacious as its later incarnation, the Marine Pavilion made quite a statement against its neighbouring buildings of brick and stone. The transformation of Holland’s Pavilion did not commence until 1815, by which time the Prince had become Regent. The chosen architect was John Nash. The entire building, both the structure and the elaborate internal decorations, took seven years to complete and was finally finished in 1823. The evolution of the Pavilion from the Marine Pavilion to the grand oriental design of John Nash mirrors the changing status of George from Prince of Wales to Prince Regent (from 1811) and finally to King George IV (from 1820). The Pavilion and its grounds not only became grander to reflect the status of a monarch, but also more private in order to shield the King from the critical eyes of the press and the public. George lived in a turbulent historical period, which experienced both the American and French Revolutions. People in Britain worried that what had happened in France might be repeated in Britain. George’s decadent antics did nothing to quell this anxiety. "Beauties of Brighton" by George Cruikshank, 1826. 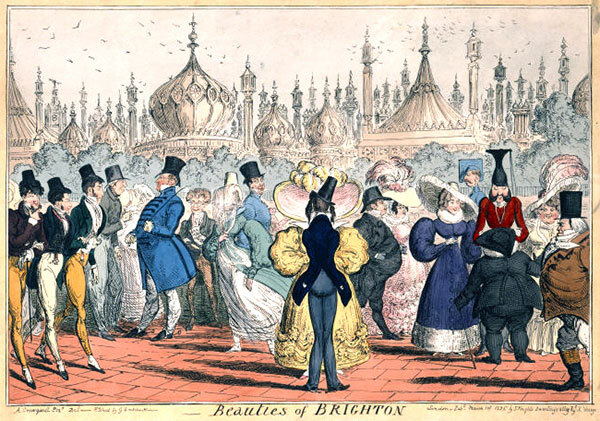 A satire on Brighton's fashionable society parading on the Steine in front of the Royal Pavilion. The building of the Royal Pavilion also coincided with Britain’s war with France (the Napoleonic Wars, 1803-1815). The war led to increased taxation, a reduction in exports due to blockades, unemployment and inflation. In this context, it is unsurprising that the extravagant lifestyle of the Prince angered many of his own subjects and ministers who felt that his profligacy was disgraceful in the face of such poverty. In great houses this room was often decorated and furnished to impress guests, but in the Pavilion it was conceived to surprise; it only hints at what is to come. The visitor today passes into the Long Gallery through a wide doorway over which originally ran a concealed staircase for servants. This bridge staircase enabled servants to move between the north and south ends of the Pavilion without being seen by guests. The Long Gallery provided an area in which to promenade. Guests would walk and converse, admiring the furnishings and décor. The Banqueting Room provided a place where a host could display his wealth and impress his guests. The table is set for dessert and George IV’s armchair can be seen in the middle of the seating arrangement. The huge domed ceiling is decorated with the exotic foliage of a plantain tree. Some elements are in three-dimensional copper, the rest is painted to create a trompe l’oeil effect. Hanging below the dome is an enormous carved and silvered dragon from which is suspended a crystal chandelier measuring nine metres in height and weighing one ton. 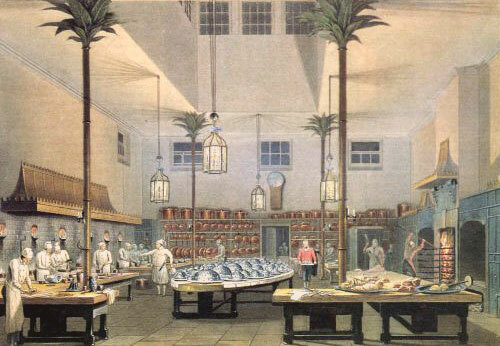 The Great Kitchen from John Nash’s Views of the Royal Pavilion, Brighton, 1826. Showing the steam table laden with silver dishes awaiting collection by the footmen. The Great Kitchen was very modern for its time and was equipped with the latest kitchen technology. 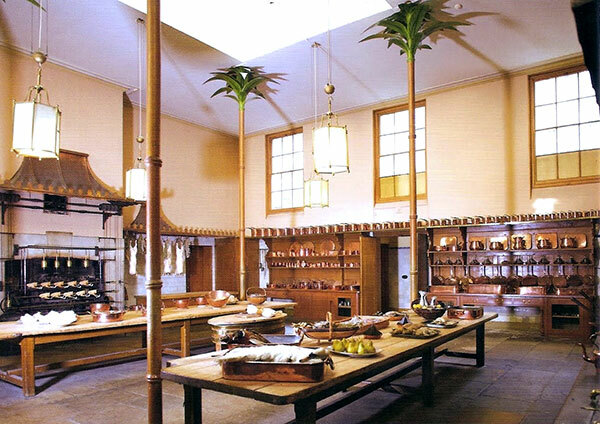 A large and airy room, the Great Kitchen was a change from the stuffy, airless, gloomy kitchens of many large houses. Similarly, its proximity to the Banqueting Room was unusual as kitchens were more commonly located at some distance to reduce the risk of fire and smells. The arrangement in the Pavilion ensured that food was served hot. The decoration in this room is toned down not only to contrast with the Banqueting Room, but also to create a calm, relaxing atmosphere. Guests would withdraw to this room after eating. Ladies would retire first, leaving the gentlemen to their port and cigars. Games such as cards, backgammon and chess would be played here. Palm trees, made of cast iron, covered in carved wood, support the upper floor. The Saloon was originally designed as the Pavilion’s main reception room. The room today contains a variety of influences: arches of Indian inspiration crown the French windows, whilst the walls contain panels of Chinese wallpaper. The couch is styled as an Egyptian river boat in patriotic homage to Lord Nelson’s victory in the Battle of the Nile in 1798. Like the Banqueting Room Gallery, this room provided calm after the grandeur of the main state rooms. The room would have been used for small concerts and recitals. The carpet could also be removed to allow the floor to be chalked for dancing. Music was a major form of entertainment at the Royal Pavilion and the Music Room was designed to enhance the guests’ enjoyment. A canopy of imitation bamboo hangs over the huge organ and the opposite wall, giving the impression of a tent. The domed ceiling is decorated with 26,000 plaster cockleshells covered in 18 carat gold. Nine lotus shaped chandeliers are suspended from the ceiling, and in total there are around 180 dragons and serpents decorating the room. The suite consisted of a bedroom, library, anteroom and bathroom (the last room no longer exists), and were the King’s private rooms. Only the anteroom was ever seen by the public, acting as a waiting room for those seeking private consultation with the King. Green walls are embellished with a complicated design of dragons, dolphins, birds and flowers. The rooms express the deeper, more reflective side of the King’s nature. 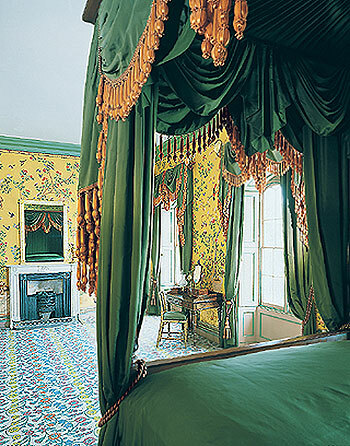 Formerly the bedrooms of George IV’s brothers, the Duke of York and Duke of Clarence, this suite of rooms includes a lobby and a servant room. Queen Victoria’s bedroom is located over the Entrance Hall, with four attic rooms above to accommodate her dressers. 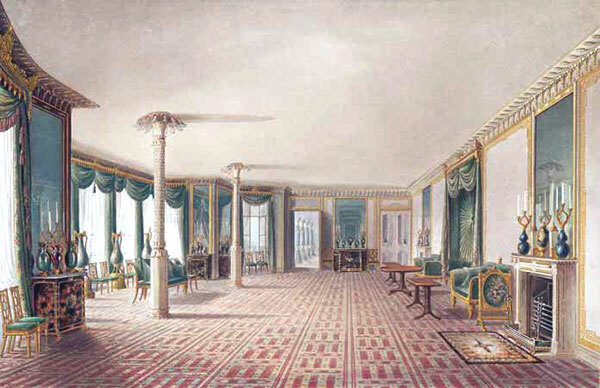 The chamber floor was adapted to accommodate Victoria’s two children and Prince Albert who visited the Pavilion in 1842. 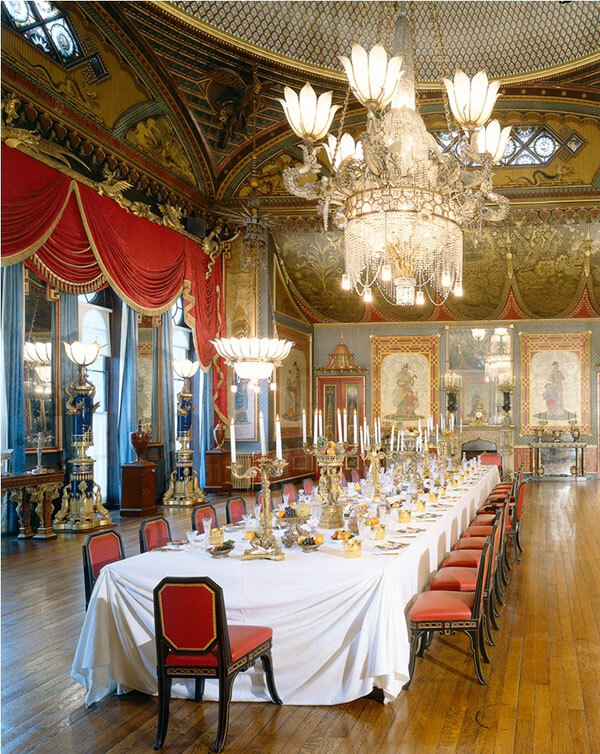 The South Galleries were used as breakfast rooms by the Prince Regent’s resident guests. The apartments to the left (east) side of the South Galleries had been used by the Prince himself until infirmity forced him to move to the ground floor. The Royal Pavilion is one of the best examples of chinoiserie in Britain and plays a crucial part in understanding George IV’s vision for the building. The fashion for chinoiserie was inter-linked with the activities of the various East Indian companies that were established across Europe from the 16th century onwards. The British East India Company was formed by a group of investors for the exploitation of trade with the East, Southeast Asia and India. The availability of imported goods such as silk, lacquer, bamboo and porcelain affected both interior and exterior design all over Europe. Many royal palaces in Europe had a room or a building with a chinoiserie interior, and by the 1750s a Chinese bedroom and dressing room were considered the height of fashion. Although influenced by Chinese goods, the idea of chinoiserie was rooted in the fantasy of a magical realm that appealed to the imagination of the European court. Chinoiserie depicts China as an idealised country, a kingdom of flowers and perpetual spring ruled over by a benevolent emperor. To British designers Chinese and Japanese dragons summed up all that was strange and wonderful about the East. These mythical beasts became common chinoiserie motifs. Other motifs included bells, birds, shells and Chinese figures, pagoda cresting, and pierced or fretted galleries. Many examples of these motifs can be found on wallpaper, ornaments, furniture and fittings in the Royal Pavilion. 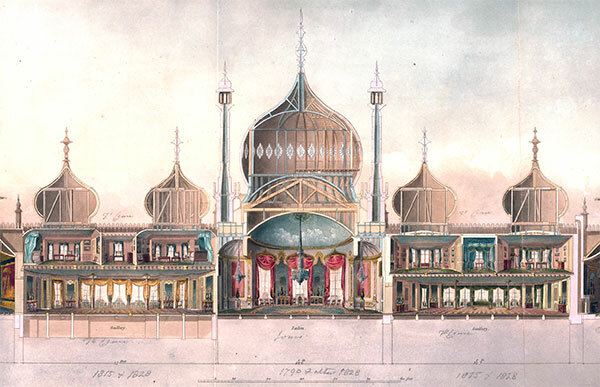 The exterior of the Royal Pavilion, with its domes and minarets was inspired by drawings of Indian architecture found in Oriental Scenery, a collection of drawings by Thomas and William Daniell who had travelled to India. Oriental Scenery was widely published and helped to popularise the Indian style. New industrial techniques of mass production continued this trend: transfer printed Chinese-style designs of tableware, especially blue and white, were cheap and popular by the 1830s. A favourite was the willow pattern, developed about 1795 by Josiah Spode. 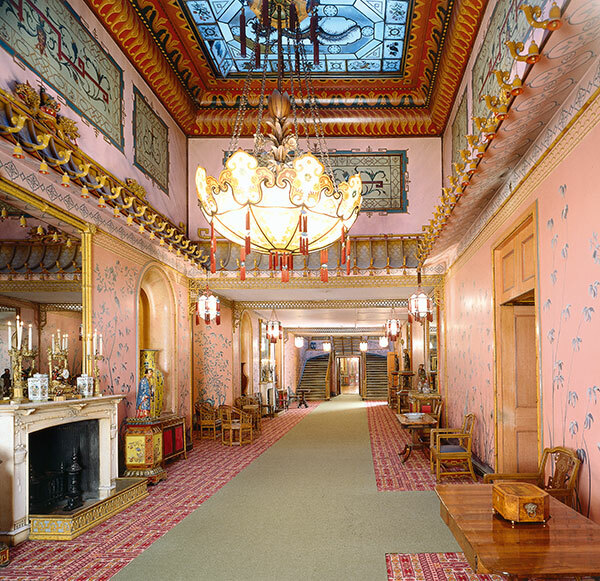 George IV was Britain’s greatest devotee of chinoiserie in the 19th century, and the fantastic and exotic decorative scheme in the Royal Pavilion reflects his desire to impress members of European courts as well as to entertain and delight his friends. George’s phenomenal and exaggerated use of oriental motifs in the Royal Pavilion heralded a reinvention of chinoiserie in Britain. Previously, chinoiserie was considered a playful style that was reserved for more private and informal rooms such as bedrooms and tea pavilions. It was also a fashion that was associated by critics with promiscuous women, so the King’s patronage of the style must have seemed shocking to many visitors to the Pavilion. Indeed, there are many disparaging contemporary comments regarding the effeminate interior. 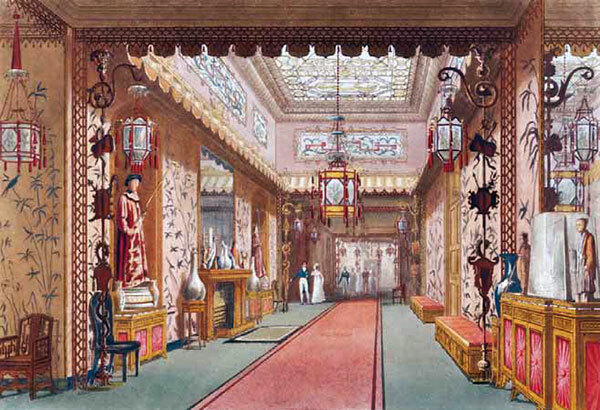 With the internal and external decoration of the Royal Pavilion, George IV transformed chinoiserie into a court style but, paradoxically, advertised the building as a residence where the rules of court did not apply. 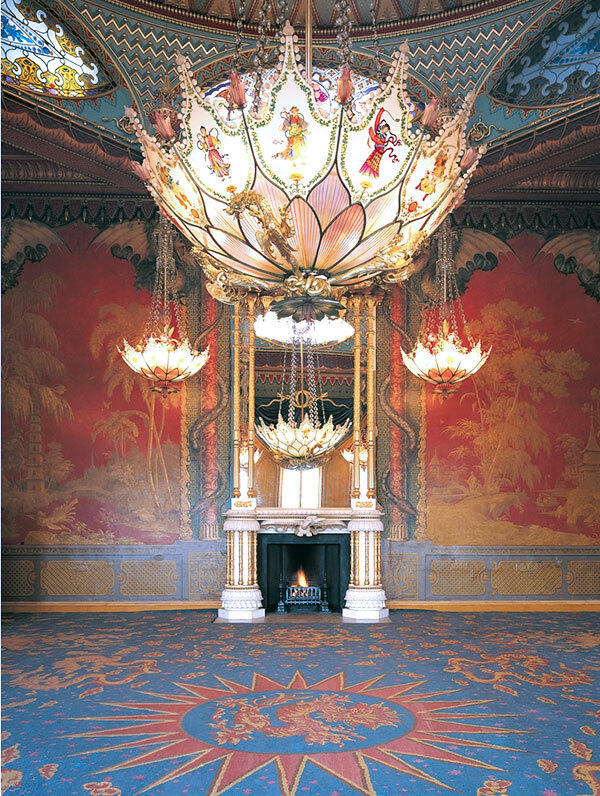 Chinoiserie was a symbol for the escapism that the Royal Pavilion offered the King. The rich colours, mythological creatures and dramatic lighting in the Royal Pavilion produced an exhilarating atmosphere, which was theatrical in spirit. Each room was designed to create a different mood. The decorative schemes work from floor to ceiling and increase in richness as the visitor penetrates further into the building. Equally overwhelming was the stifling, perfumed air that pervaded the building and the luxurious Axminster carpets in the Banqueting Room, Music Room and the Saloon, into which the feet of the guests would literally have sunk. The building induced a sensory overload that left many guests struggling to describe the experience of visiting such an incredible place. This sense of fantasy combined with chinoiserie is evident in the optical illusions and decorative tricks that characterise the Long Gallery. Cast iron is made to look like bamboo and carefully placed mirrors reflect images across the gallery, exaggerating its length. Imitation Chinese bells hang from scrolls above trellises of imitation bamboo. The central skylight is decorated with dragons, flowers and the Chinese God of Thunder. The hand-painted Chinese wallpapers in the Adelaide Corridor probably date from the second half of the 18th century. They are unique in being the only original Chinese papers left in situ in the building and have survived despite the physical wear and tear of a domestic area, and the harmful effects of varnishing in the Victorian period. The panoramic landscapes are filled with hunting scenes, processions of large figures, and a dragon boat festival over which the eight immortal Taoist gods preside. Perhaps unsurprisingly the most dramatic examples of chinoiserie are reserved for the main state rooms. 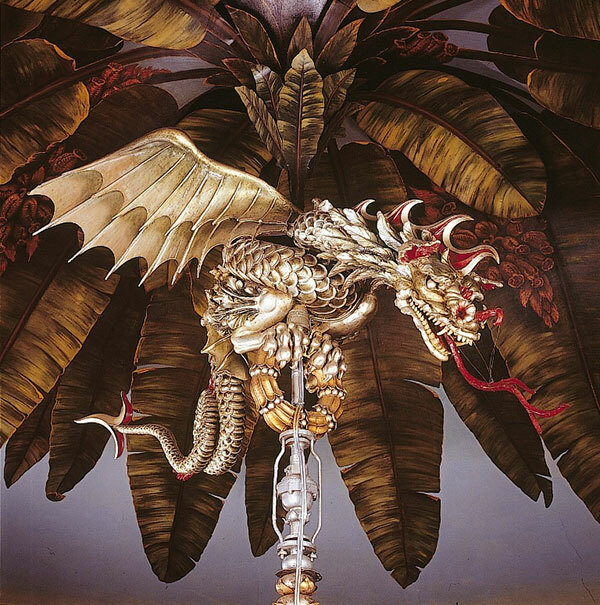 In the Banqueting Room the centerpiece is the huge chandelier, held in the claws of a silvered dragon, which is surrounded by six smaller dragons that would have exhaled light through lotus glass shades. The effect would have been dazzling. The walls of the Banqueting Room were hung with large canvases painted with Chinese domestic scenes mounted in trompe l’oeil trellis frames. The elaborate furniture includes lamps with dragon mounts, sideboards with gilded dragons and canopies decorated with bells hang over the doors. In the Music Room, the chinoiserie scheme reaches its crescendo. The room is like a huge lacquered box lit by water lily and dragon shaped gasoliers. Blazing crimson and gold Chinese landscape murals framed by gigantic serpents and winged dragons cover the walls. Trompe l’oeil landscapes were often painted on walls in 18th century houses, but here pillars, dragons, serpents and trellis work, rather, deceive the eye. Drapes of blue and crimson satin at the floor to ceiling windows are supported by dragons and serpents. The domed ceiling of the Music Room is covered by 26,000 overlapping cockleshells, reminiscent of the scales on snakeskin. Gilding was used on the cockleshells to create an illusion of height; this was achieved partly by the sizes of the cockleshells diminishing towards the apex, and partly by changing the tones of the gilding. 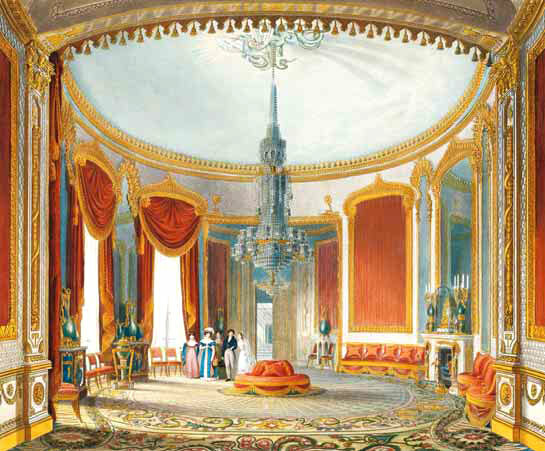 The Prince Regent wanted the Royal Pavilion to be the ultimate in comfort and convenience, and there are many examples of how the Pavilion benefited from modern equipment and progressive technology. Nash’s remodelling of the Pavilion often involved ingenious solutions to structural problems and the use of materials previously not associated with interior design. For example, in order to give the Saloon a larger Indian inspired dome, a cast-iron structure was erected around it on which an iron frame for the new dome was rested, thus avoiding any damage to the ceiling of the dome below. Cast iron was also cleverly used in the Long Gallery where it allowed sturdy staircases to be constructed which looked like bamboo, in keeping with the gallery’s chinoiserie scheme. The King was enormously proud of the Great Kitchen, and guests were escorted to inspect this room, conceived by the King as a continuation of the Pavilion’s public apartments. One of the key pieces of new technology in the kitchen was the steam table. It was fitted with a cast-iron top, and bound in brass. Food, prepared and arranged on silver dishes, was kept warm on the table, which was covered with a cloth. This allowed numerous prepared dishes to be kept warm ready to be served in the Banqueting Room. The table was heated by the main and scullery boilers by means of an extensive copper piping system. On the south wall of the Great Kitchen was another example of innovation. The smokejack was a more sophisticated and efficient version of a Tudor spit. It was automatic, activated by the heat of the fire. Fitted with five 2-metre spits, the smokejack allowed the chef to prepare several different roasts simultaneously. The Great Kitchen also benefited from an ice house, which stood in the southwest corner of the grounds. In cold winters ice was collected in carts from local ponds and streams, and placed in pits lined with layers of straw to provide insulation. In proper conditions ice could last all summer, providing a continuous supply for culinary and medical uses. Lighting by day and by night was crucial in creating the dramatic atmosphere of the Pavilion’s elaborate interiors. The Pavilion used a range of different lighting techniques including wax candles, tallow (animal fat) candles and oil lamps. There was a room dedicated to storing the huge quantity of lighting supplies. The smoke from the numerous chandeliers, lanterns and oil lamps that lit the interior so brilliantly inevitably caused damage to the paintwork and ceilings, requiring regular cleaning and re-painting to maintain the splendour of the Pavilion. Gas lighting was installed outside the Music Room in 1821 and used to light the elliptical windows from the exterior, suffusing the interior with soft colours. 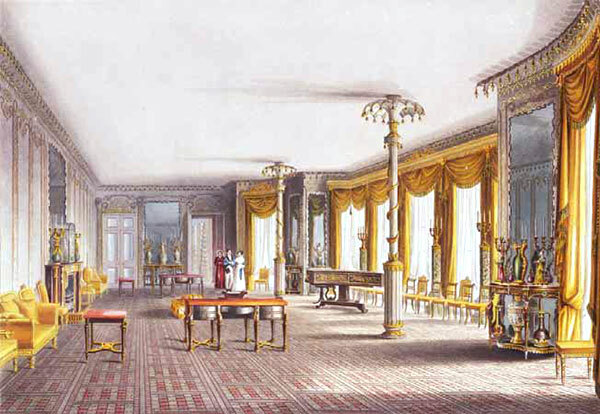 A final progressive piece of technology in George IV’s Pavilion was the provision of water closets. This modest-sized Pavilion had over 30 water closets and the ladies’ retiring room near the Banqueting Room, had its own private water closets for female dinner guests. The water closets throughout the Pavilion were supplied with water from cisterns. Water was pumped throughout the building through iron mains and lead pipes by a forcing engine in the water tower, which was located in the kitchen courtyard to the south. The preparation and consumption of food were key activities in the social life of the Royal Pavilion, and around a quarter of the space available was allocated to the Great Kitchen and the range of ancillary kitchens. Many elaborate banquets were held in the Pavilion. In 1816–17 the Prince Regent secured the services of the renowned French chef Marie-Antoine Carême who devised elaborate menus with as many as 60 dishes. On one occasion he prepared a menu of 116 dishes served in 36 courses for the brother of the Tsar, Alexander the First of Russia. Dinner was served promptly at 6pm. Dinner guests assembled in the galleries, where the Prince would join them. On the announcement of dinner he would lead the way into the Banqueting Room accompanied by the highest ranking women. George IV was instrumental in introducing the new fashion of ‘promiscuous seating’ which enabled him to sit close to the ladies of his choice. Rather than sitting at the head of the table, as tradition dictated, George IV preferred a more informal seating arrangement where he sat among his guests. Dinner could be a lengthy affair, lasting up to five hours. If the King had 36 guests for dinner there would be a minimum of 18 footmen assisting the guests. Dining à la française, was the norm, but dining à la russe, was becoming fashionable around this time. A la française meant all the food for each course was displayed on the table at the same time. The presentation of the food was very important. Guests would either serve themselves or be assisted. A la russe meant that each dish was served to the guest. Each course was accompanied by either cool white wine or champagne. Red wine at the time was considered indigestible at meals. George IV’s favourite drink was cherry brandy. Dinner was followed by conversation, games or musical entertainment, which lasted until the early hours of the morning. Music was George IV’s other great passion and, appropriately, the Music Room is just as grand as the Banqueting Room. In this extraordinary interior, the King’s own band entertained guests with selections from Handel or Italian opera. The band usually played between 9 o’clock and midnight, and were kept in Brighton on a retainer salary. Famously, the Italian composer Rossini visited the Pavilion in 1823 and performed for the King. Rossini later met the King several times in London, where they sang duets together. George IV enjoyed singing and would often contribute to an evening’s entertainment with popular airs accompanying himself on the pianoforte. The Prince Regent’s interest in the arts extended to the theatre, and in 1806, he gave his royal assent to the building of the Theatre Royal on New Road, to the west of the Pavilion grounds. The Theatre Royal in its original form was built in an unprecedented ten months and first opened its doors to the public on Saturday, 27 June 1807 with a performance of Hamlet. The first 50 years of the Theatre Royal were uncertain due to the part-time patronage of fashionable society who only visited Brighton during the winter season. As a result, no manager lasted longer than 18 months. The glory days of the Theatre Royal would arrive with the railways in the Victorian era. The people of Brighton eagerly waited for George IV’s visits, which raised the profile of the town. Newspapers such as the Sussex Weekly Advertiser and the Brighton Gazette would report on the activities of the Prince, his state of health and who visited the Pavilion. By 1800 it had become, according to the Brighton Directory, ‘the most frequented [and] without exception one of the most fashionable towns in the Kingdom’. The Prince’s presence in Brighton, and the fashionable society that followed him, brought considerable prosperity for those with direct contact with the monarch and those on the outskirts, although it should also be remembered that the Prince was notoriously bad at paying his bills promptly. 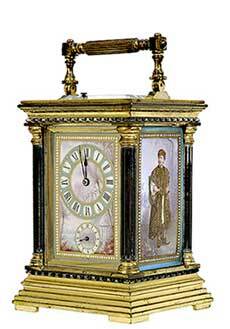 George IV paid his staff quite well by the standards of the day. On retirement, the pension given to staff was generous and sometimes equivalent to the salary for the post. A list of proposed pensions submitted to the Treasury in 1837 suggested an annual pension of £50 to a housemaid who, after 25 years’ service, could no longer undertake her duties owing to ill-health and infirmity. Similarly, other service industries benefited from the King’s residency in Brighton. An account from the Public Record Office shows that in the first three months of 1821, Mary Rowles, the local laundress, washed over 2,500 dusters for the Pavilion. At the beginning of the 18th century the town’s shops had mainly catered for the fishing professions, but, from the late 18th century onwards, London based retailers started to arrive. Shops such as silver and goldsmiths, linen drapers and tailors emerged and, by 1800, 50-60 shops could be found on North Street. Some of the shops had royal patronage. Thomas Nightingale was a glover and breeches maker and would even clean the Prince’s hunting breeches. The sign outside his shop consisted of a huge stuffed leather glove. The presence of royalty and aristocracy also brought new services to the town: coffee houses, banks, circulating libraries and theatres emerged around the Steine. Holland and Nash’s rebuilding of the Prince’s home and those of his wealthy friends provided work for local tradesmen, labourers and craftsmen. Over the next decades elegant town houses, squares and crescents were constructed reflecting the affluence and popularity of the town. Some buildings attempted to imitate the style of the Royal Pavilion, like the Western Pavilion constructed at the end of the 1820s for Amon Wilds. Wilds was a local architect responsible for many of the buildings in Brighton. The explosion of new building dramatically altered the landscape of Brighton, including the area around the Royal Pavilion itself. When the Prince of Wales first rented Thomas Kemp’s farmhouse it had little land attached to it. Over time, more land was acquired, buildings demolished and East Street closed, to provide the Pavilion with a private eight acre park. As a concession to the disruption caused by closing East Street, the Prince Regent built New Road along the western edge of the grounds. The Steine also experienced a change in character, owing to its proximity to the Pavilion. Initially used by local fishermen to dry their nets, it now became a fashionable place to be seen and to promenade upon. One of the reasons that people kept coming to Brighton was its continuing reputation as a health resort. It was the main reason the Prince had first visited Brighton in 1783. A notable figure in the development of Brighton’s bathing industry was Sake Deen Mahomed, who moved from India to Britain in 1810 and opened the first Indian restaurant in London, the Hindustanee Coffee House. Unfortunately it was not a success and, bankrupt, Sake Deen Mahomed moved to Brighton in 1814, where he established a vapour bathhouse on the site that is now the Queen’s Hotel. Sake Deen Mahomed called himself a ‘shampooing surgeon’ and offered his clients a massage with Indian oils (similar to an aromatherapy massage). He received a royal warrant for his baths from George IV and supplied the Pavilion with towels and brushes. He also installed a vapour bath for the King in the Royal Pavilion. Having patronage from the King assisted Sake Deen Mahomed in gaining a reputation in Brighton and attracting an important clientele that ensured prosperity not only for himself, but for others involved in the bathing industry. Queen Victoria first visited the Royal Pavilion in 1837. Her initial reaction was cool: ‘The Pavilion is a strange, odd, Chinese looking place, both outside and inside. Most of the rooms are low, and I can see a morsel of the sea, from one of my sitting room windows’. She visited the Pavilion again in 1838 and 1842 before finally resolving to sell the Pavilion in the late 1840s. Her decision to sell was based on various factors. The Pavilion was never designed to be a family home and Victoria recognized that she would struggle to accommodate her growing family in the limited private apartments. The proximity of the Pavilion and its grounds to the center of town and its increasing population also meant that it lacked the privacy and isolation the Queen desired (and found at Osborne House, her preferred holiday retreat). 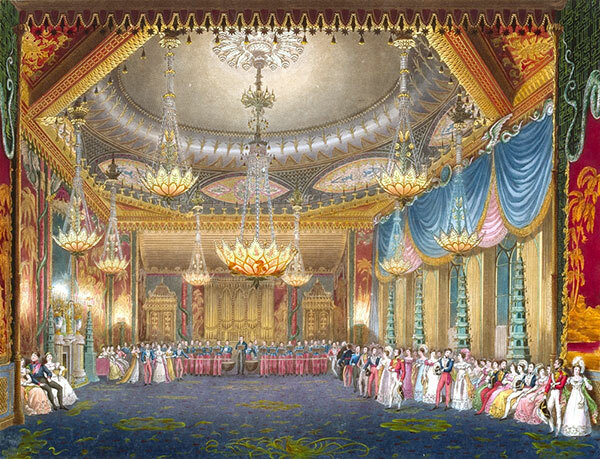 Finally, the extravagance embodied in the Royal Pavilion was at odds with the more reserved character of Victoria’s reign and it may have been a politically astute move for Victoria to distance herself from her self-indulgent uncle’s taste and lifestyle. When the possibility of buying the Royal Pavilion from Queen Victoria was raised, leading figures in the town recognized the importance of the building not only to the town’s history but also to its economy. The building was purchased by the town of Brighton in 1850 for £53,000 and remains to this day the only royal palace not owned by the state or the Crown. However, any celebrations at securing the Pavilion were somewhat dampened by the fact that the building was virtually empty. Prior to purchase, the interior was stripped of virtually all furniture and fixtures, including wallpapers, decorative features and chimneypieces, though many original items were subsequently returned by Queen Victoria and successive monarchs. The new ownership of the Pavilion and its grounds marked a change in status, from a place of decadent exclusivity to a popular center for wider society to enjoy. During this period the Pavilion was frequently used for social or civic events such as fetes, bazaars, baby shows, exhibitions, charity balls and conferences. Other buildings within the Pavilion grounds were also developed for wider usage. The Riding House was transformed in 1868 into a venue for the weekly corn market. The Royal Stables (now the Dome) were reconstructed as a concert hall in 1867, and although originally housed in the Pavilion, a museum, art gallery and library were built next to the Dome in 1873, on a site originally intended to be used as a tennis court. The Victorian period saw the expansion of Brighton from a fashionable town providing amusements to the elite few to a busy popular seaside resort that accommodated both very rich and very poor people. In this period, the population grew from 7,000 in 1801 to 46,661 in 1841, and was an incredible 120,000 by 1901. The development of the railways played a major part in this transformation. The arrival of the railway in 1841 brought Brighton within easy reach of day-trippers from London. Before the opening of the railway, any Londoner wanting to travel to Brighton would have had to pay over £1 for an uncomfortable six hour stagecoach journey. The new railway offered London-to-Brighton return trips, taking two hours each way, for approximately 15 pence. By 1860, Brighton was receiving 250,000 visitors a year by train (little wonder that Queen Victoria felt Brighton could not provide the isolation she craved). The growth in population brought about by the railways had an impact on the geography of Brighton. Rows of terraced houses appeared to accommodate the town’s growing population. A wide-reaching programme of public works was undertaken to sustain the new population. Civic works included the construction of a vast sewer system to improve sanitation and a public transport system of trains and trams. The railway network itself dramatically changed the landscape of the town. Giant viaducts stretched over the town’s streets and the locomotive works, now the New England quarter, brought heavy industry into the center of the town. Bathing and seaside holidays continued to attract holiday–makers, and amenities were developed to meet the increasing demand for tourist attractions. These included pleasure grounds and parks, music halls, an aquarium, two piers and, by 1850, over 500 places where you could drink alcohol. The tourist boom also resulted in the development of new hotels and lodging houses for upper and middle class holiday-makers who came for week-long holidays, unlike the day-trippers from London. Hotels such as the Grand and the Metropole became symbols of opulent grandeur and set a model for hotels elsewhere. Cast iron became a fashionable building material in Victorian times, and structures such as the West Pier and Palace Pier gave Brighton’s seafront its distinct Victorian character. For a long time, the seafront had benefited from three piers. The Chain Pier had been built in 1823 as a landing stage to help passengers disembark from larger ships with ease. The Chain Pier was different from typical piers because, rather than being built on stilts, the deck of the pier was suspended from chains attached to pillars. The pier was destroyed in a storm in 1896 but, prior to this, had become a popular promenade for Victorians who enjoyed the sensation of walking out over water. Brighton seafront and its holiday-makers also benefited from the unusual invention created by inventor and engineer Magnus Volk. The electric railway that Volk invented in 1883 still runs along the seafront today. It was the world's first publicly operated electric railway when it opened, and was quite a revolutionary idea. At that time, parts of the track actually ran on stilts on the beach, ten to 20 feet up. In 1896, Volk proposed extending his Volks Electric Railway to Rottingdean. The railway took passengers further out to sea, some 50 metres offshore, operating on stilts. It was nicknamed the Daddy Longlegs at a fairly early stage, because of its strange appearance. During the First World War, the Royal Pavilion complex was used as a military hospital for wounded soldiers. Between 1914 and 1916 over 4,000 Indian patients passed through the hospital. Substantial alterations were required for this purpose. In addition to the operating theatres, nine kitchens of three different types were established: one for meat-eating Hindus; one for Muslims and one for vegetarians. Although it may be viewed as a naïve or simplistic choice today, at the time the decision to care for wounded Indian soldiers in the oriental splendour of the Royal Pavilion would have seemed appropriate and fitting. The contribution made by Indian soldiers and their link with Brighton is commemorated by two memorials. The first is the Indian Gate on the southern side of the Pavilion’s entrance. The gateway was the gift of the people of India and was unveiled by His Highness the Maharaja of Patiala in 1921. The second monument, known as the Chattri, was erected on the Downs outside Brighton. It was unveiled by the Prince of Wales in 1921. The memorial was built on the exact spot where the bodies of Indian soldiers had been cremated. The painstaking task of restoring the interior of the Royal Pavilion to its former decorative splendour was begun in earnest in the late 1940s. The aim has always been to restore the Royal Pavilion to how it looked in the 1820s during George IV’s reign. The programme of restoration has revived many of the skills and crafts which were employed in the original building of the Royal Pavilion. * wet and dry rot. At one period, the roofs of both the Music and Banqueting Rooms were in danger of collapsing owing to the rotting laminated beam ends which supported the characteristic tented roofs. * cracked stonework caused by dampness, the salty atmosphere and traffic pollution. Restoration suffered further setbacks in the form of an arson attack in 1975. The attack severely damaged the Music Room and it took 11 years to repair the damage. The same room suffered further damage in the great storm of October 1987, when a stone ball crashed through the roof, undoing much of the recently completed restoration work from the earlier arson attack. The restoration of the Pavilion has relied upon gifted visionaries and generous individuals, who, by their enthusiasm, have been able to keep the Pavilion in the public eye, saving it from demolition on more than one occasion. These individuals have included curators, conservators and members of the council. 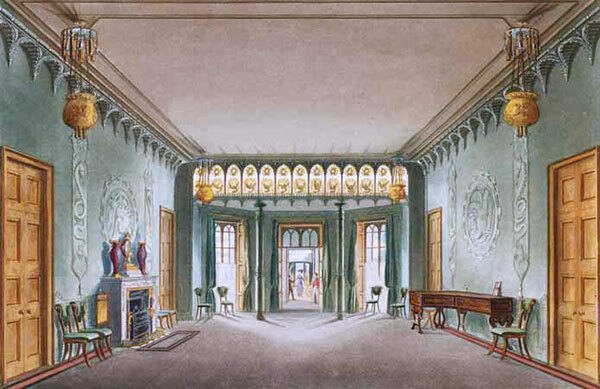 Equally important has been the support of the various monarchs since George IV, who have returned many of the Pavilion’s original fittings and furnishings. The Royal Pavilion is the only royal palace to be owned by a city. As Brighton & Hove City Council’s financial commitments to the community encompass a wide range of services, the Royal Pavilion has to supplement the budget allocated for it by the council. Apart from charging admission, the Pavilion is able to secure funds through grant-awarding bodies and sometimes through sponsorship from local business for one-off events. Approximately 100 people work in the Royal Pavilion today, a figure that corresponds to the number of servants that George IV used to employ in the Pavilion. The Royal Pavilion is an important tourist attraction enjoyed by around 300,000 visitors per year. 41-45 percent of visitors to the Pavilion say it is their main reason for visiting Brighton & Hove. Therefore the building is crucial to the tourist industry in the city, and there are many ways in which the influence of the Royal Pavilion can be felt in the modern day character of Brighton & Hove. The city continues to attract thousands of holiday-makers and day-trippers each year, although the trend for short-break holidays is stronger than the family holiday market these days. Part of the city’s seaside appeal for visitors remains its reputation as a party town. Just as the Prince Regent enjoyed the freedom and pleasures that Brighton offered him away from the confines of court, so too do many visitors to Brighton & Hove. The city’s many nightclubs attract large numbers, all looking for escapism and fun. The Royal Pavilion is the centerpiece of the cultural quarter in Brighton & Hove, which also includes Brighton Museum & Art Gallery, the Dome complex and Theatre Royal Brighton. The Brighton Festival is now the second largest arts festival in Europe and once again reinforces Brighton’s image as a city with a vibrant cultural arts scene. During the festival, houses, pubs, clubs and churches are transformed into galleries, theatres and concert halls hosting a diverse range of artistic events. Many parallels can be found between Brighton & Hove during the festival and the heady atmosphere that surrounded the Royal Pavilion during the Regency period. Ever since the Prince Regent patronized Brighton, the city has become synonymous with rebellion and embracing alternative lifestyles. Often referred to as "the gay capital of Britain", Brighton has a substantial gay population and is host to Pride every August, which attracts thousands of participants and spectators. The Royal Pavilion represented a rebellion in terms of courtly style and behaviour, and this spirit has continued throughout the 20th and 21st century. In keeping with the trend for a bank holiday day trip to Brighton, begun in Victorian times, Brighton beach was the location for the infamous clashes between Mods and Rockers in 1964, which led to widespread panic across the country regarding the increasing wildness of young people. The originality evident in the design of the Royal Pavilion continues to influence the character of Brighton. Buildings such as Jubilee Library, the proposed Brighton i360, and Frank Gehry’s King Alfred development, sustain Brighton & Hove’s reputation for innovation and cutting edge design. Equally forward-thinking is the growth of new industries in Brighton. With the decrease in heavy industry and the closure of the railway works in the 1950s, there has been a growth in businesses involved in digital and new media, resulting in the city often being referred to as ‘Silicon Beach’. The Royal Pavilion transformed the fortunes of Brighton by attracting wealthy visitors and increasing the demand for a range of services. The tourist industry remains a key part of the city’s economy, generating £380 million each year. However, aside from specific tourist attractions, visitors to the city can also enjoy over 2,000 shops, which are mainly located in the area between Western Road and the Lanes – areas made fashionable during the Prince Regent’s time. The city remains a popular place to live and work attracting a large number of businesses and people. In 2001, the city’s population was estimated at just under 250,000. The Royal Pavilion has become an iconic symbol for the city of Brighton & Hove that is recognized by the city’s inhabitants and visitors alike. More than any other image, it epitomizes the spirit of Brighton, symbolizing fun, originality, innovation and a healthy disregard for convention. Without the Royal Pavilion, Brighton would be similar to Worthing or Bognor Regis, or any other seaside town. It is the continuing influence of the Royal Pavilion that gives Brighton & Hove its unique and magical quality. John Nash engaged to remodel the Pavilion. Existing rooms are altered and notable additions include the Banqueting and Music Rooms and the Great Kitchen. The exterior is redesigned, inspired by Indian architecture. A lavish chinoiserie style dominates the interior. About 300,000 people visit the Royal Pavilion each year. Brighton & Hove is the most popular coastal destination for foreign visitors to the UK.